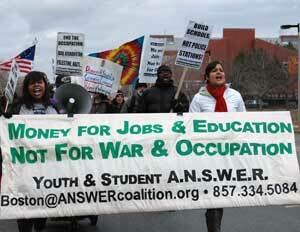 Community members, anti-war activists, students and veterans from all over the greater Boston area came together for a rally and march in the Roxbury neighborhood to mark the eighth anniversary of the Iraq war. The demonstration was part of a Day of Action with events taking place in more than 40 cities across the country, and many others around the world. The action was held at the Southwest Corridor Park, directly behind Boston Police headquarters and the Alice Taylor housing projects, with the theme “From Boston to Baghdad: End the Occupation.” The action not only denounced the ongoing U.S. wars and occupations abroad, but also the war on working people at home: from the education budget cuts and anti-union attacks to police brutality and anti-immigrant racism. Other speakers included Pat Scanlon, coordinator of Veterans for Peace, Smedley Butler Brigade; John Harris, union organizer and member of the Stop the Wars Coalition; Frank Neisser, International Action Center; and Frances Villar, the Party for Socialism and Liberation’s New York City mayoral candidate in 2009. Following the rally, demonstrators marched through the Roxbury and Jamaica Plain neighborhoods. The march stopped before Roxbury Community College to highlight racist police brutality and the high-profile beating of a 16-year old on campus in October 2010. The police demanded that demonstrators keep moving and blasted their sirens in an attempt to drown out Zaldana’s speech denouncing police violence, but demonstrators cheered her on and stood firm. Marching past the Hennigan Elementary school, protesters drew attention to the recent decision to slash the education budget and close 17 schools throughout the city. The Boston School Committee has more cuts on the way as part of an all-out assault on education. The ANSWER Coalition has been conducting a petition campaign against the education budget cuts taking place in Boston. The march concluded at the Veteran Affairs Hospital, bringing attention to the impact of the war on U.S. veterans. “Leg amputations have become the signature wound of the Afghanistan war. … Many soldiers suffering from PTSD are simply re-deployed to the battlefield,” stated Zaldana. High school student Adanarys Barragan delivered a message on behalf of El Movimiento, a student organization that has been fighting for quality education in Boston schools, and particularly for the inclusion of Ethnic Studies in the curriculum.